The LG Panther GW910 is undoubtedly one of the few known Windows Phone 7 handsets to set its foot in the spotlight already, but now we're getting to learn more about this handset after some additional specs have been leaked. 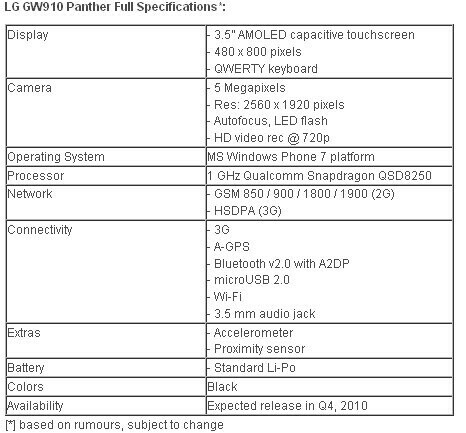 So far it looks like Windows Phone 7 handsets that are revving up to tackle the platform's launch are all going to pack some decent specs, but we're specifically seeing what's expected to come with the LG Panther. One thing stands out from the usual high-end specs needed for Windows Phone 7 devices – the LG Panther should satisfy those looking to record any action at any given moment with its ability to record videos in 720p. Aside from that, it'll feature a 3.5” WVGA AMOLED touchscreen, 1GHz Snapdragon processor, 5-megapixel auto-focus camera with LED flash, aGPS, Bluetooth, Wi-Fi, 3.5mm headset jack, and of course 720p video recording. Judging by the current trend, we're starting to see a handful of devices that are able to shoot video in 720p – and the LG Panther is obviously included in the pack. However, devices that can shoot in 1080p down the road should naturally become the cream of the crop.